In my opinion, a nice feature that Sweethome3D could provide is the possibility of creating a roof. An option similar to creating a floor or wall but that creates a roof based on the size you choose, as usual. In this way the current creation of the roof, which requires particular time, would be simpler, like everything that can currently be done with SH3D. Can someone say me if it is so difficult to implement this feature into sh3d? I would like to try to realize it someway. You already did well in your little house! But if you want to see more roofs, have a look in this blog article : Okh especially did a nice library? ..difficult to implement this feature into sh3d? Actually, just like you made nice roofs on your Mini Cottage already. thank you very much for the link about the roofs!!! 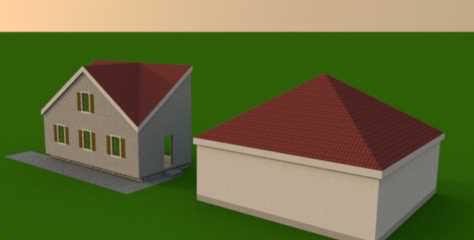 Thank you okh, I think you are right, using roof objects is better to create different kind of roofs. Thank you for the library about roofs :). Okh I want to ask you how did you realize this roof on the right of the picture, I need to do exactly this kind of roof. As UbuntyBirdy says, and as with most roofs, the model is quite simple to make with AoI, Blender, Sketchup or FreeCad. If you know how. The one in the image, is made from identical roof module triangles), fit together and grouped. While that is a flexible and generic approach to enable many kinds of roofs with few models, it is a bit cumbersome. So, I think there are also some pyramid models posted in SourceForge (roofs). For a pyramid roof, I would probably do like UbuntyBirdy, but for my own use I would probably also add a ceiling, sides and texturemap the roof (vt) so a texture (rooftiles) you add later will look the same on all sides, e.g. an .obj file looking something like this. Copy the text and save as pyramidroof.obj and import to SH3D (.mtl not needed for std colours: Java3DCubeColorsWithTransparency). Maybe see if you could help youseeus on the roof plug-in he started to program.